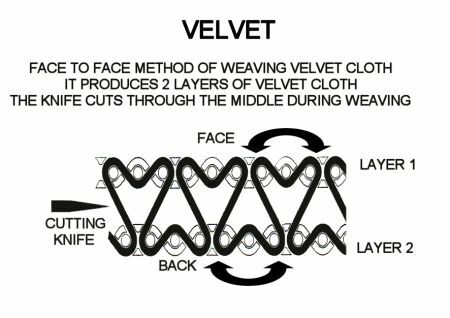 Plain weave diagram. Source: BBC. Two things determine a fabric, the yarns used and how they’re assembled into fabric. Here’s a quick glossary. There are many more ways to weave and knit than are listed here, and I’ll add to the list over time, but these are the most common methods. Warp and Weft Warp yarns run the length of the woven fabric. They must be strong enough to support the weight of the finished material. When you hear of fabric being cut on the grain, it is being cut on a line parallel to the warp yarns. Weft yarns are those that are woven over and under the warp in various ways. My mnemonic to remember the difference is that weft rhymes with left and weft yarns run left to right. Grain A fabric’s grain is (almost always) a line parallel to the warp threads. Barring certain exceptions, you will always cut your fabric on a line along with the grain of fabric. Because warp threads have to be stronger than weft, this ensures that your fabric is as strong as possible – given the yarns used. 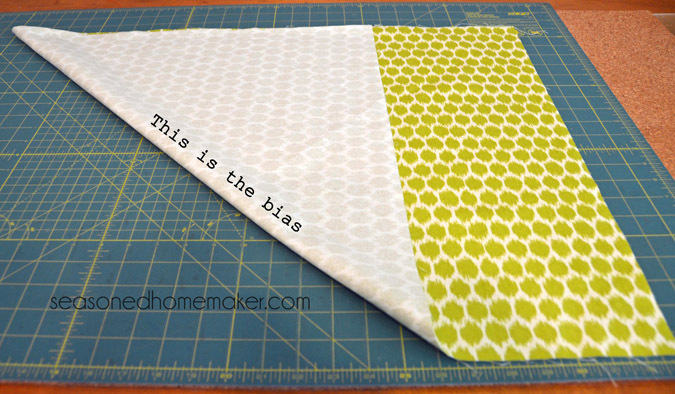 Bias The bias line is a line that runs diagonally across the fabric, at 45 degree angle to both warp and weft. If you were to tug on your fabric along that line, you’ll feel more ‘give’ than you would along the warp or weft. Even very tight, dense weaves will give a little along the bias. Pieces cut on the bias are more flexible than pieces cut on the grain. Bias-cut fabric makes for slinky evening dresses that closely follow the shape of the wearer. Bias-cut dresses were THE thing in the 1930s (when the technique was first popularized). Knit fabrics don’t have a bias. Plain weave – the oldest and simplest there is. A weft yarn goes under a single warp yarn, then over one, then under the next, etc, etc. Also called tabby weave Examples of plain-woven fabrics include muslin, challis, chintz, georgette and organza. Twill weave – in which a weft thread follows a regular pattern of over-and-under, going over at least two warp threads as a part of the pattern (for example: over 2 warp threads, then under 1). Each weft thread is offset from the one previous to it – it picks up the pattern at a different starting point. This creates a distinctive diagonal ridge in the finished fabric. The most well-known example of a twill weave is denim, with gabardine coming in a close second. The herringbone pattern is a variation of a twill weave. Satin weave – in which several weft yarns go over the warp (also called “floating”) and then under a single thread before coming up again. This weave, when created with low-twist fibers, creates satin’s shiny finish. It also means the fabric is more prone to fraying and snagging, as it’s not as strong as a plain or twill weave. Satin fabric. Basket weave – in which more than one weft yarn crosses over and under one or more warp yarns. For instance, the weft might go under two warps, then over three, repeated ad infinitum. The weft yarn is not offset as it would be in a twill weave. Examples of basket weave include duck cloth, Oxford shirt cloth and canvas. Jacquard weave – a complicated process requiring a special loom in which large-scaled patterns are woven into the fabric (instead of printed on top). Examples include brocade and damask. Dobby weave – another process requiring a special loom, in which a small, repeated geometric pattern with a “waffle” texture is woven into the fabric. Piqué is a dobby weave. Pile weave – in which visible loops are created by the weft threads. If the loops are left uncut, you get terrycloth. When the loops are cut, you get velvet and corduroy. Sometimes referred to as “napped” fabric. The difference between nap and pile. Knit – In which the yarns are looped together, rather than woven – just like how you knit a hat by looping a single length of string (although only weft knit fabrics use a single yarn – warp knits use multiple yarns). As This looping is what makes a knit fabric stretchy. Wool, by itself, isn’t all that elastic. But when looped into a knit, the fabric can stretch and return to its previous shape – up to a point. Our forbears wore knitted tights, the fabric of which would flex with the wearer’s movement – but only for so long and that’s why elastane is such a big deal. As per home knitting, a variety of stitches and techniques are used to produce different effects. The most common example of a knit fabric is jersey. Some fleece fabrics are also knitted. 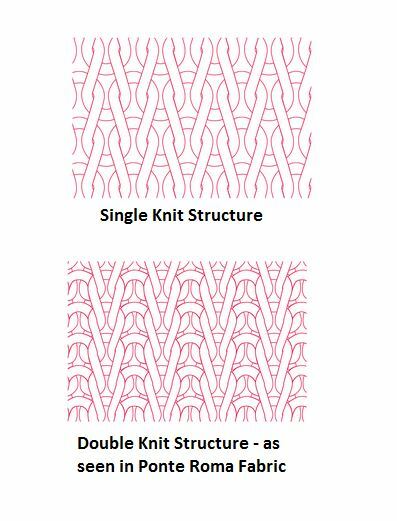 Double-knit – heavier and more durable than single knit fabrics, double-knits are produced by two sets of yarns knitted together. Usually has fine ribs on both sides of the fabric, but is reversible The cut edges of double-knit fabrics curl less than single knit and thus can be easier for at-home seamsters to sew. Interlock – similar to double-knit, but created with a slightly different technique. Thicker than regular single-knit jersey. Also has very fine ribs running the length of it. Rib knit – created by alternating knit and purl stitches, this fabric has a ribbed surface, and stretches more across the width than it does along the length. A four-way stretch, but often employed just for the two-way stretch.